The old time name for Gyrfalcon is "Ice Hawk" because it lives above the arctic circle in places like Iceland, Greenland and Alaska. When word of one that has wandered south hits the Internet, birders go running. 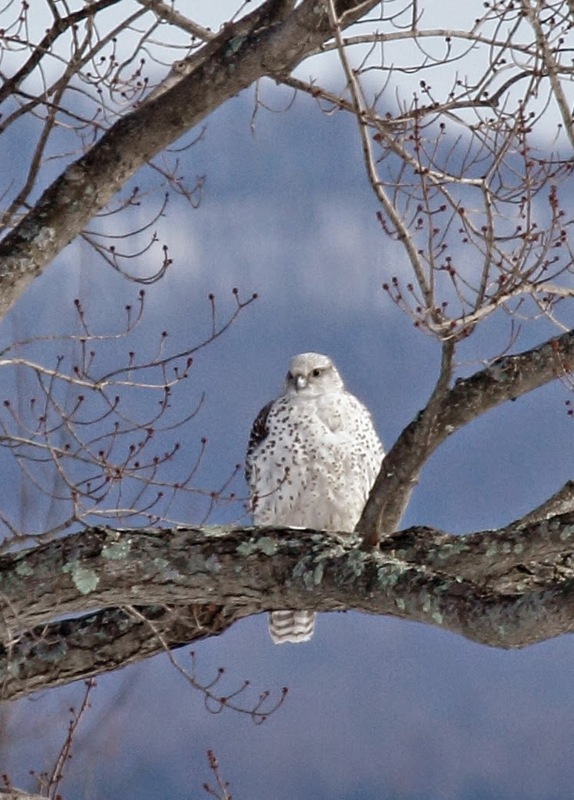 That happened last week when a Gyrfalcon was found in Wallkill New York. Marty and I decided to take a trip up to see it if it continued to be reported over the weekend. It was, so we headed up highway. We arrived at the road where everyone had been seeing the falcon at 12:45. Only one other car was there. Not a good sign when such a rarity is reported. The guy told us that the bird was seen earlier but had flown out toward the other road. We stood there for awhile and a few more cars arrived. Marty started chatting with one of the guys and found out that he is a neighbor of Marty's sister. Go figure. 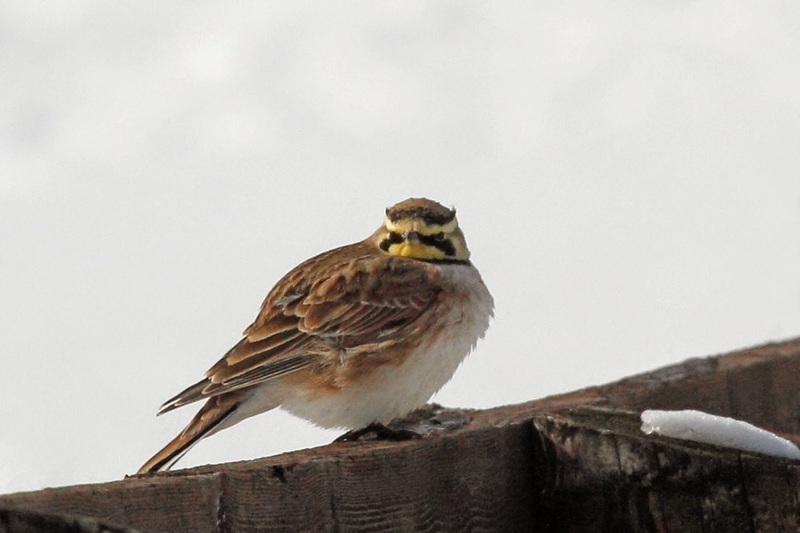 I tried to photograph Horned Larks while we waited for the falcon to show up. You can actually see the horns in this photo. We stood there and stood there and finally, another birder got a phone call - the bird was on the other road. We all jumped in our cars and raced around the corner where we should have been all along. It was a "bird jam" of cars, people, scopes and cameras. Paparazzi. We jumped out of the car and . . .
. . .there he was in all of his glory. An adult male Gyrfalcon. Far from home and livin' large. The best part of the day was that this was a lifer for both me and Marty. It was also Marty's 600th ABA bird which made it even more special for him. This is us trying to show 600 with the Gyrfalcon in the background. This is an awesome bird. 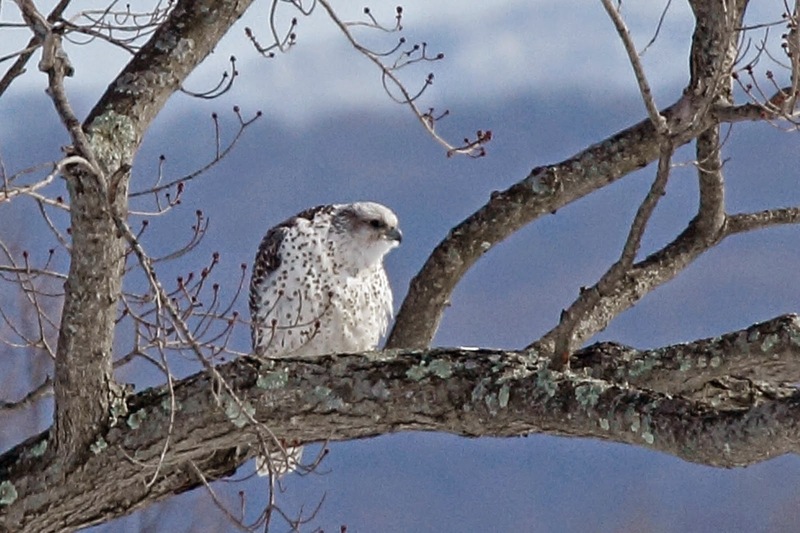 The largest falcon, Gyrfalcons come in a variety of colors - dark, gray and white. This one is actually a gray phase because his back is gray. You can see the top of the wings here are gray. He was pumping his wings just before takeoff. When this guy flies, he is gone! 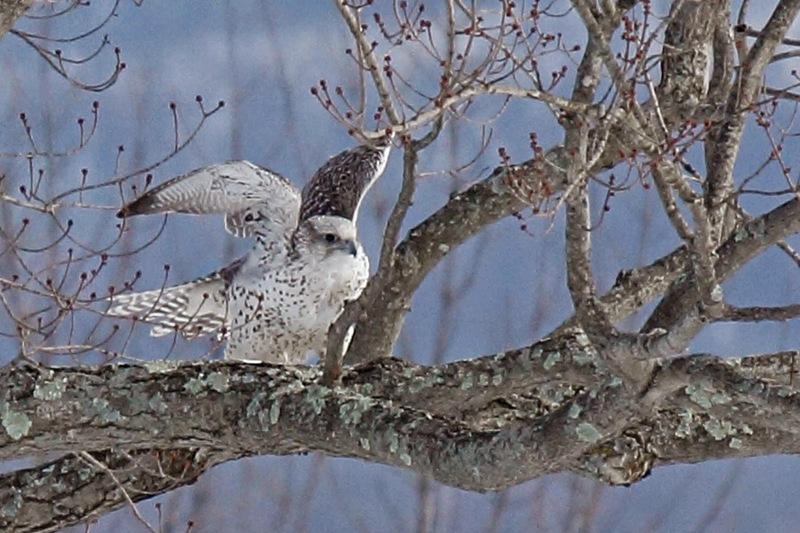 One of the fastest fliers in the world, the Gyrfalcon is out of sight in a few seconds. He landed farther down the road in his favorite Spruce tree for a while, then headed down to the horse farm. We followed him but didn't get any better photos than these. I think the saddest thing about the day is that the best photo that I have of the bird was taken with the iPhone through the spotting scope. Look at that! I might throw my camera in the trash soon. Another iPhone photo from the end of the day. We went over to the nearby grasslands in hopes of seeing Rough-legged Hawk and Short-eared owl. Got them both. Here is a digiscoped photo of the owl. Not as good as the other one, but this bird was pretty far away. All in all, it was a great day. We didn't feel the cold. We didn't mind the 3 hour drive home either. We saw a Gyrfalcon. How awesome that you got this bird! And congrats to Marty!